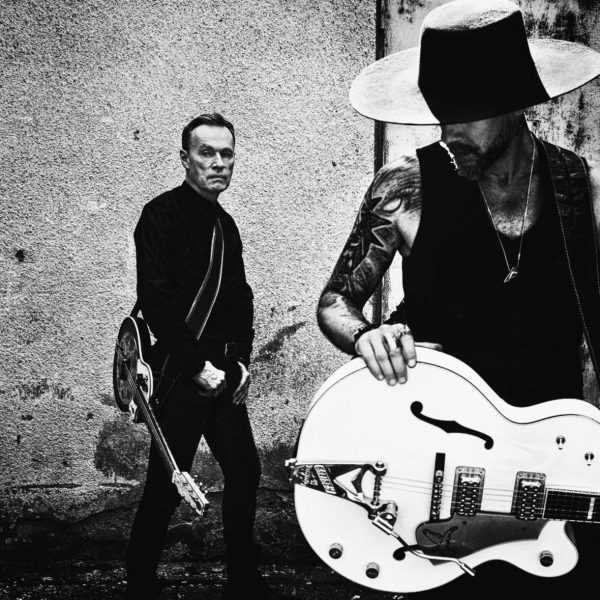 ME AND THAT MAN, the side project put together by Nergal of Behemoth and British/Polish musician, John Porter, have today unveiled a new video for ‘Ain’t Much Loving’, taken from their forthcoming debut album, ‘Songs of Love And Death’. The collection is set for release on 24th March via Cooking Vinyl. Check it out below. ME AND THAT MAN also play their first UK show at London’s Jazz Cafe on Sunday 26th March. Tickets are on sale now from this link. ‘Songs of Love & Death’ is a journey across bleak, dust-ravaged plains, soundtracked by low-slung guitars and steeped in the rawest essence of rock and blues. The tracks draw on dark narratives familiar to fans of Nick Cave, Tom Waits and Leonard Cohen and crackle with an evocative, sinister aesthetic. Admirers of everything from Johnny Cash’s American Recordings through to the grim, frontier polemic of Wovenhand will be drawn in by these songs. ‘Songs of Love And Death’ features sleeve artwork by Daniel P. Carter and is available for pre-order now at this link. Pre-orders via iTunes secure you a download of ‘My Church Is Black‘ and ‘Ain’t Much Loving‘ right away. A range of vinyl and special bundles can be picked up here.